Thursday nights I put on real clothes and sometimes even fix my hair! I don’t wear “real clothes” all day at home with a 10 month old who could dirty my entire outfit without even breaking a sweat! I am usually in sweats! Same thing for the hair. Most days I don’t bother because she is either going to pull it all out or slobber it all up! I put on real clothes and sometimes even fix my hair on Thursdays because I attend a ladies small group Bible study. I sometimes fix my hair because I don’t always get to shower with enough time for it dry and be fixed. On those nights my sunglasses serve as a head band… 🙂 But my friends understand! One of the awesome things about this group of ladies is that not one of these friends would care if I actually showed up in my sweats! I put on real clothes though because sometimes this is the first time I’ve left the house since Sunday for church… and “real clothes” feel nice. I Love that I get to spend time with these amazing women each week. I Love even more that I get to spend it with them praising and seeking Jesus. He is the center and our reason for meeting. 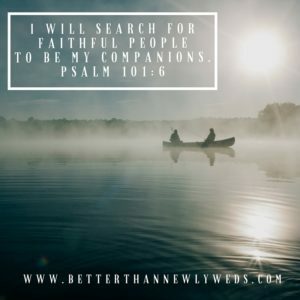 My husband Loves that I spend time seeking Jesus as well. In the beginning it was hard for me to think about doing it every week… leaving our baby and husband every Thursday. BUT… after my very first time I knew I needed to make this a priority. I knew I was right where God wanted me to be at just the right time. My husband noticed a difference in me as well and always encourages me to go. God absolutely led me to this group. The first time I went was the day I found out my mother had been diagnosed with breast cancer. I was pregnant with our first child, her first grand child, and God provided real friendship and support when I needed it most. These ladies, my sisters, prayed with me and for me as if my struggles were their own. It has been over a year now that I have been a part of this amazing group of ladies and God continues to show up and show off every Thursday when we meet. He has provided the perfect environment for me to grow as a wife and a new mom by investing in my relationship with Him. Because of this group, and how God has grown me through the Bible studies we have done, I have stepped into my calling as a writer. I feared failure before but God has shown me that if I would just “be with Him” He will “send me out”. ( Mark 3:14 ) He will send my words where they need to be read for His glory! Without the prayers and encouragement of my sisters in Christ… I would still be selfishly keeping my words to myself in fear of rejection. What glory did God get from that? Are you in a small group? If not, I challenge you to find one to try out. This group has changed my life and I Thank God for them daily. Life is hard. We all need friends who will pray us through. I am better wife and mother for having been a part of this group. My marriage is better also! In what ways has a small group impacted your life? I would Love to hear your testimony! Comment below. P.S. My mom is now cancer free living in her dream house loving on her grand baby! Thank You Jesus!